The Pearl Rhythm Traveler is the perfect kit for both silent practice and compact live performance. If you're like most drummers, rehearsal time is limited. Simply finding a place to practice without disturbing the peace can be a nightmare. But imagine being able to practice anytime of the day or night, on a full size five piece kit, without disturbing people in the next room. Then imagine carrying the same kit, neatly stacked in the passenger seat of your car, to do a live gig. Rhythm Traveler combines both these drumming necessities at a price well within reach of any working drummer. Rhythm Traveler is the go anywhere, practice anytime kit of your dreams. 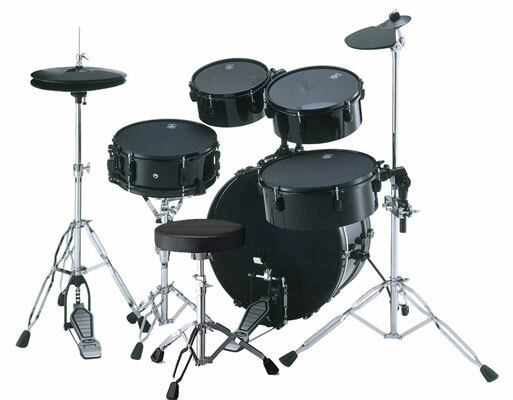 With Rhythm Traveler, you get a complete set of ultra-high quality drums and hardware, specifically designed to be lightweight yet super sturdy and highly durable. Rhythm Traveler shells are manufactured by Pearl's patented Heat Compression Shell Molding System, which is the same process used for every drum Pearl makes. Tom sizes are 10-inch, 12-inch and 14-inch and their 5-inch deep, single headed design allows them to neatly stack for compact travel while producing a great tone for live performance. Rhythm Traveler's wood shell snare drum is 13x5-inch and produces a very warm, full bodied snare tone with excellent crack. With Rhythm Traveler, you get two complete sets of heads, one for live performance and one set of Pearl's Muffle Heads for silent practicing. Muffle Heads are manufactured of a super strong mesh fabric that responds like a regular drum head, while producing virtually no sound. Rhythm Traveler produces the realistic feel of a regular kit, complete with rim shots, every time you rehearse. And the best part is changing from a practice kit to a live kit is as easy as changing the batter heads and adding cymbals. Speaking of cymbals, the Rhythm Traveler comes with real cymbals for live playing: a 16-inch crash/ride cymbal and a pair 13-inch hi-hats. Thick rubber cymbal mufflers are included for practicing. Rhythm Traveler is great for the working drummer needing a small portable kit, the beginning drummer needing to get started with a high quality set, or any drummer that's tired of practicing at someone else's convenience. Pearl Rhythm Traveler Features Double Braced Stands Brass Ride/Crash Cymbal Brass Hi-hat Cymbals Rubber Cymbal Mufflers Muffle Heads (Mesh) Plastic Heads Muffle Head Pearl's Muffle Heads allow you to silently practice anytime while maintaining the feel of a regular drum head. Silent Cymbals Together with Pearl's Muffle Heads, Rhythm Traveler's Rubber Cymbal Mufflers offer the perfect combination of feel and performance. The Forum FZH Drum Set includes absolutely everything you will need to get started on your path drumming satisfaction, including a set of high-quality cymbals, a pair of 5A sticks and a sturdy drum throne. Pearl Forum Upgraded Features for 2010 Pearl's patented Integrated Suspension System Tom Mounts, already featured on Pearl's Vision Series, now come standard on Forum. The I.S.S. Mounts attach to the hoop of the toms without contacting the shell, maximizing resonance and minimizing time spent changing drumheads. Improved cymbals provide a much higher quality sound, new low-mass lugs increase resonance, and three finishes (Jet Black, Red Wine, Pure White) that feature black drum hardware, making them the only standard black drum hardware kits in their class. Every Pearl drum is made using Pearl's Superior Shell Technology for extreme strength, optimal resonance and superior tone. Forum is no exception, and it is Pearl's superior quality at every level that sets a Pearl drum apart from any other in the industry. Pearl believes so strongly in its product that it offers a Limited Lifetime Warranty on every wood drum it makes. It is this commitment to quality that makes Pearl a leader in today's percussion world. Pearl Forum FZH Features: 6 ply 7.5mm Poplar Shells Perimeter EQ Bass Drum Heads Matching Wood Snare Drum Matching Wood Bass Drum Hoops I.S.S. Tom Mounting System Pair Of 5A Drum Sticks Cymbal Pack includes: Ride, Crash, and Hi-Hats Forum drums are made from 100% Poplar. These 6 ply, 7.5mm shells give the Forum drums a punchy, consistent tone. All Forum drums are made with Pearl's exclusive Superior Shell Technology (S.S.T.). This is the very same process that every other Pearl drum is created with, including Reference and Masterworks, which gives Forum drums a level of quality and consistency that other drums in its category just can't match. Forum's great-looking, rugged cymbals are perfect for the drummer just starting their career. With 14 inch Hi-Hats, a 20 inch Ride Cymbal and an improved 16 inch crash, you will be ready to rock in any style of music. 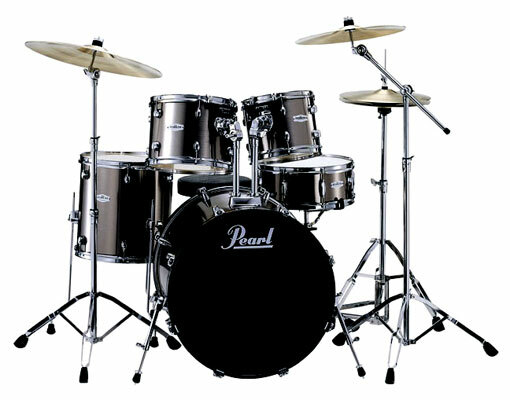 Forum has it all, plus the quality and sound you can only achieve with a Pearl drumset. With Forum Ready-Set-Go! You get a complete 5 piece set of drums, a full set of rugged double braced hardware, a heavy duty throne, high quality cymbals, a pair of Vic Firth drum sticks. You won't find a better way to get started on the drums than with this Pearl package.